Virtualization platforms like VMware and Hyper-V have made IT infrastructure simple, but not less expensive. Backup products for these virtualization-specific environments are too myopic, ignoring the physical machines, legacy backup needs and the possibility of cloud and SaaS applications in the environment. As a result, IT professionals are left having to deploy multiple cheaper backup solutions targeting each backup requirement, making backup management cumbersome and more expensive than what it should be. Go with a legacy application that protects their entire environment while tolerating extremely high pricing or Use some of the new environment-specific softwares that do not fully exploit the capabilities of modern environments like virtualization and the cloud. These solutions often also have a relatively small customer base which means the solution has not been vetted as well as some of the legacy applications. Vembu is a next generation company that provides the capabilities of the new class of backup solutions while at the same time providing a completeness of platform coverage similar to legacy applications. Vembu is a privately held company, founded in 2002. For more than 10 years, their go-to market strategy was to engage channel partners and service providers who then resold their products to their customers. As Vembu delivered its solutions as a “white-label”, the service providers rebranded the product with their name provided Backup as a service to their customers. As a result, although more than 60,000 businesses have used Vembu products, you may have never heard of them. There are multiple backup and disaster recovery needs for a single organization. You may want to backup physical machines or just want to go for File-level or Application-level backups instead of backing up the entire machine. You may also want agentless backup for all the virtual machines running in your virtualization platforms. Vembu BDR Suite is a one-stop solution for your Backup & DR needs as there are different products targeted for different requirements. There is the agentless backup of all the VMs in your VMware and Hyper-V environments. With the latest version 4.0 upgrade, Vembu has also started supporting backup of VMs in a Hyper-V cluster. They also offer image-based backups for your Windows servers and workstations. If you want to backup only certain files or folders and applications, you can go for File & Application Backup. If you run any Linux-based virtualization platform like KVM, you can use Windows Image Backup for all the Windows VMs and File & Application Backup for all Linux VMs. Apart from backups, there are two disaster recovery options that will save your business if your backup server goes down from a disaster. 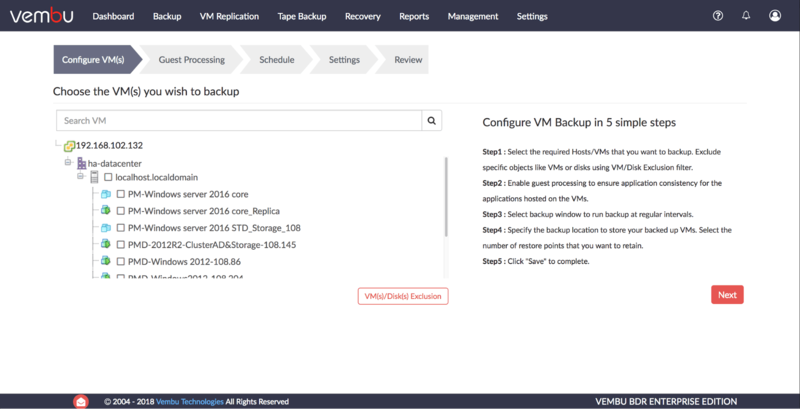 You can replicate the backup data to your offsite datacenter or to Vembu Cloud hosted in Amazon Web Services. All these capabilities and more can be managed from a centralized portal. But backups are not enough. 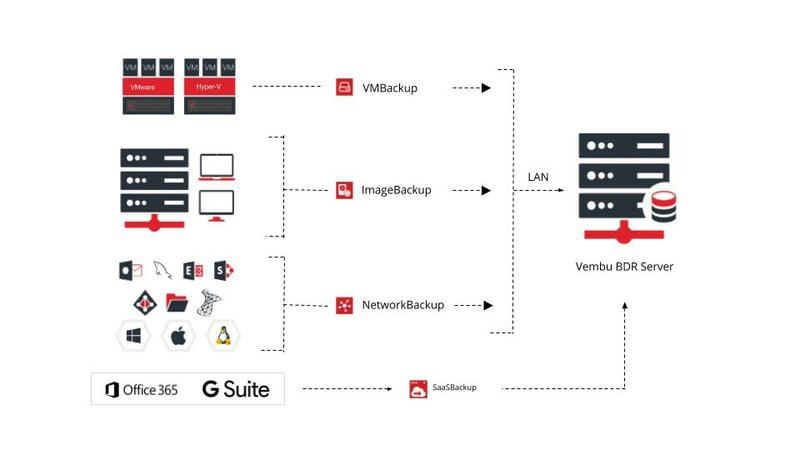 Vembu also proves it can handle diverse and advanced use-cases with multiple recovery options for your image-based backups. Instant recovery is on our mind at Storage Switzerland, a “must-have” feature. It is the ability to recovery an application on the device on which it was backed up. It can eliminate file transfers and thereby deliver sub-15 minute recovery time objectives. Vembu provides instant recovery not only for VMware and Hyper-V VMs, but also for physical machines. More importantly, it can recover to a variety of hypervisors including VMware, Hyper-V and Linux based hypervisors like KVM. Any changes made in this quick-booted VM is also saved for future recovery. Apart from the standard recovery of the VM (or physical machine), there is option to perform granular recovery of individual files or application items for quicker recovery of critical files. Vembu also allows you to migrate your workloads across platforms or hypervisors (P2P, P2V, V2V). This is made possible by storing the backup data in a neutral file format and allowing end-user to download the image file in the file format required (like VHD, VHDX, VMDK, RAW) to migrate the machine or perform bare metal restore. Administrators can program these instant recoveries to occur automatically every night, including sending a screenshot of the running VM. In other words, Vembu provides the ultimate in DR Verification. Vembu also has the ability to recover in cloud providers like Amazon. While recovery is a little slower since it has to transform the VMs – it is still quite fast. All the reports for each backup job can be scheduled to be sent to your inbox periodically or viewed in real-time with Vembu’s centralized monitoring and management tool called Vembu BDR360, that is especially useful in larger environment with many backup jobs. The storage back-end can often kill a data protection process. Many software vendors count on expensive hardware to provide them quality storage management and data protection. But this doesn’t exactly deliver what administrators are looking for – affordable data protection. Vembu takes the route of providing efficient backup data storage by virtualizing its backup repository as a file system using VembuHIVE. This lets them provide complete capabilities like supporting both scale-up and scale-out of storage, built-in version control, error correction as well as data efficiency techniques like compression and deduplication. Finally, they secure the backup data by encrypting it with AES-256 bit encryption algorithm. This allows customers to use off-the-shelf storage hardware and provides a complete software feature compliment. Vembu provides rich feature support of modern environments without leaving legacy environments out in the cold. It also is extremely complete in its coverage of operating systems, hypervisors and SaaS solutions. Finally, it does all this at a price point that should be very attractive to its target small to medium sized business customers. Vembu deserves strong consideration for organizations looking to get more modern features without giving up support for legacy applications.